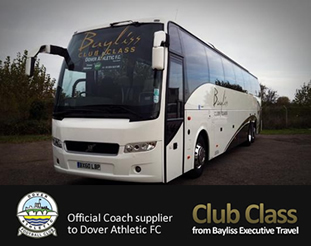 Today, Dover Director Alistair Bayliss has announced that his company, Bayliss Executive Travel will be increasing it's sponsorship of the club. The Deal-based company has been providing the official first team coach for the past year as well as supporters coaches for the past four. As part of the deal Bayliss Executive Travel will become 'Official Travel Partner'. Alistair said “It has been a fantastic week for the club off the field and we're laying great foundations for next season. I am delighted to announce a sizeable sponsorship commitment from Bayliss Executive Travel. “As a company, we recognise the hard work being done by everyone at the Club, and hope that our contribution will help with that."